There are many debates that rage through the annals of geekdom. Star Wars vs. Star Trek. Picard vs. Kirk. Batman vs. Superman. But there's one question that rises above them all: lightsaber vs. Superman. 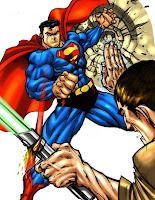 Specifically, can a lightsaber cut through Superman? The question first gained notoriety from a posting in Yahoo Answers that is hilarious in the answer's sincerity. Gizmodo took a serious tackle at it as well, but it turns out this battle raged at the force.net six years earlier. Personally, I say no. Not because of some fanboy "Nothing-beats-Superman" logic or technical minutiae, but because of this point that is brought up multiple times: in Episode 1, we saw that the lightsaber can instantly cut through anything except a blast door. That took a while. That means there are limits to the lightsaber's cutting power. I have to believe that Superman is denser than a blast door. The question implies a combat situation, where Luke Skywalker is fighting Superman. If Luke wants to cut Superman, I imagine the lightsaber bouncing right off Superman's body. Then Luke holding Superman down while he forces the lightsaber into Superman's chest. Not gonna happen. Here's a better question: Superman vs. Death Star? I say Death Star wins. Wow...tough question. I have to say Superman would beat the Death Star, if only because the Death Star isn't made of Kryptonite.